Microsoft announced an update to its Office Web apps, focusing on collaboration between coworkers, as well as bringing new features over from its Office software package. The idea is to “make it easier for users to start and finish projects on the Web,” said Amanda Lefebvre, senior program manager for Office Web Apps, in a recorded video that’s published to the Web. The features that Microsoft showed are still in development, and will be eventually rolled out to users, executives said. Microsoft has always struck a balance between leaving features only with its for-pay Office suites or offering them as part of its free Office Web apps as well. Add too few features to latter, and users will turn elsewhere for alternatives. But if Microsoft adds too many capabilities to its free Web apps version, customers may consider ditching the company’s standalone software or its Office 365 subscription service. Microsoft has also expanded its reach to other platforms, using the Web apps to penetrate markets like the iPad, while its dedicated software serves the Mac, the PC, Windows Phone, and now the iPhone, with the just-released Office Mobile. 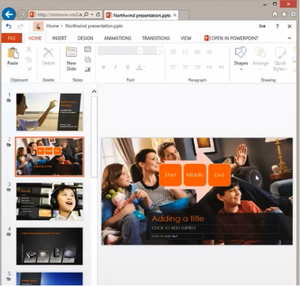 The Office Web App version of PowerPoint includes new SmartArt capabilities. Dan Zarzar, an engineer with the Office Web Apps team, said that the features that are prioritized and brought over to the Web Apps are done in collaboration with customers. The company reads every piece of feedback to the Office Web Apps team to facilitate that process, he said. “We’re focusing a lot on upcoming releases on improving the collaboration story across the board,” Zarzar said, with deeper social integration into Yammer, SharePoint, and Exchange. The new Word Web App shows collaboration, find-and-replace, and more. Within Word, Lefebvre showed off the collaborative features, as well as new features, such as find and replace, headers and footers, footnotes, and add comments to the editing view. 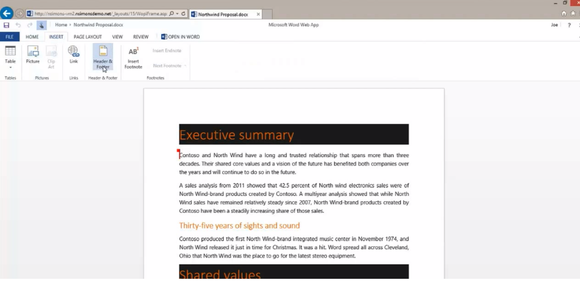 Previous versions of Office Web Apps could add tables, but the new revision will add formatting and real-time changes. The Office Web App version of Excel, with data validation. 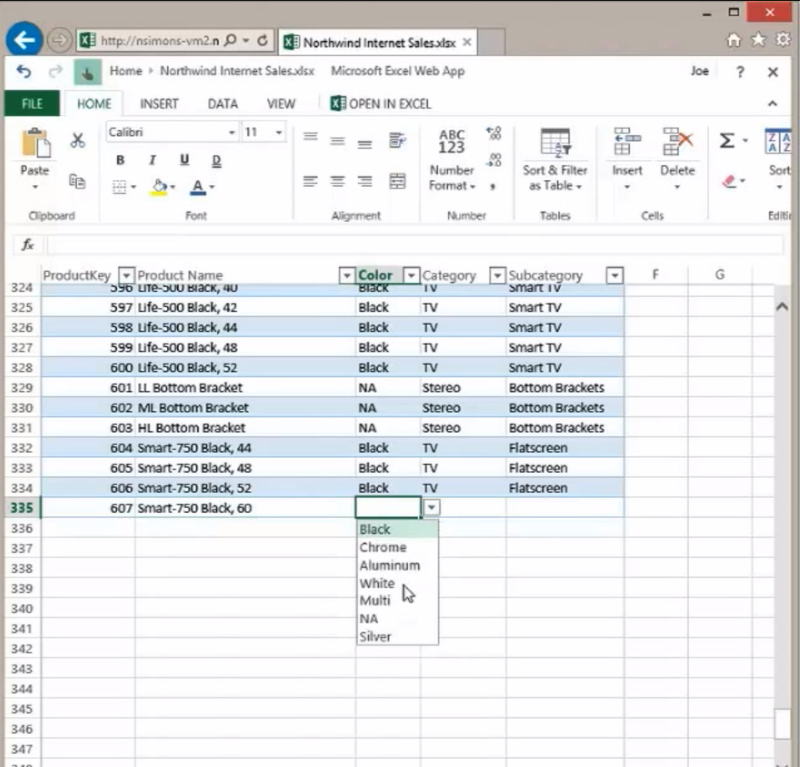 Excel’s new improvements include autofill, a feature that’s been part of the desktop version of Excel since Excel 2003. Also new is data validation, which will allow the creator of the workbook to set drop-down options to restrict—or manage—the type of data that can be added to a field. 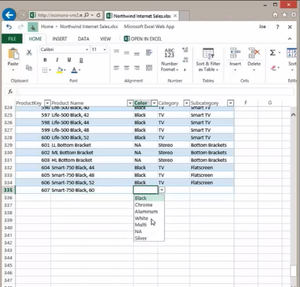 “Fast field” features allow for quick navigation inside of a massive spreadsheet. And within charts, users can see the “presence” of a collaborator inside another cell, and can see real-time changes as they’re being made to the chart. Collaboration will also come to PowerPoint. With the upcoming changes, users will be able to see changes as they’re being made, live, in real time. New slide templates have been added, and users will be to able to reformat pages. SmartArt has also arrived on the Web App version of PowerPoint, with users being able to take text and to reformat it in a graphically interesting way that can be edited and reformatted by a collaborator. “This isn’t available now; it’s on the horizon, it’s imminent,” said Jeremy Chapman, Office senior deployment lead, of the new features.